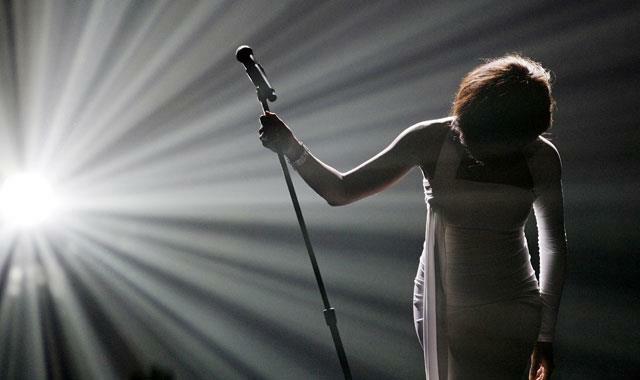 Diva Devotee: [New Music] Whitney Houston Feat R Kelly "I Look To You"
[New Music] Whitney Houston Feat R Kelly "I Look To You"
The first song to be taken from The Best Of Whitney Houston album, which hits the shelves on November 13th, has hit Youtube. I Look To You, which was originally the title track of the departed Diva's last album, has been reworked and now features vocals from its writer, R.Kelly. With themes of personal struggle and faith, I Look To You was a fitting comeback song for a star that had been dogged by so much controversy in her career. However, knowing how the tragic tale ended, I look To You has forever since taken on a bittersweet quality; with the lyric, "The rain is falling, defeat is calling, I need you to set me free, take me far away from the battle", being particularly moving within this new, unfortunate context. Listen to I Look To You Feat R.Kelly, below. Indeed the original is FAR superior. Also its hard to swallow she is gone, it's like it all happened yesterday. I hope its not another milking the dead singer situation, if it is her daughter should be the one receiving the money and not money hungry record execs looking to parasitise from those who are no longer here! This practice of taking deceased people's work and using/abusing it for your own "work" seems to me incredibly offensive. Both to the legacy of the deceased and to art in general. I really could not agree more with you Opie, it is really annoying that people think they have the right to do so too, yeh he might have written the song, but she was the one who made it what it was. I didn't know he wrote it but that still doesn't excuse him using her track. Her voice was HER artistic property in my opinion.